← Can You Ever Really Know an Author? 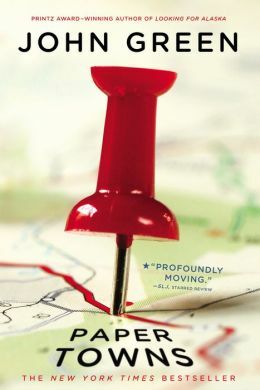 An article in the LA Times “Book Jacket” – Florida School Nixes John Green’s ‘Paper Towns,’ Prompts Outcry– reporting on the book banning of this young adult mystery in Orlando, Florida, had me searching for the book. Although I have avoided John Green’s much touted The Fault in Our Stars – too sad – I have liked the author ever since I saw him interviewed on the Colbert Report. I am number 10 on the wait list at my library – so someone must be reading this book. Have you? One month before graduating from his Central Florida high school, Quentin “Q” Jacobsen basks in the predictable boringness of his life until the beautiful and exciting Margo Roth Spiegelman, Q’s neighbor and classmate, takes him on a midnight adventure and then mysteriously disappears. This entry was posted in authors, books, essays, mysteries, news article, reading, young adult lit and tagged Colbert Report, Fault in Our Stars, Florida, John Green, Junior Library Guild, Margo Roth Spiegelman, Orlando Florida, Paper Towns. Bookmark the permalink. Did they give a reason for the banning?